What is the future of libraries? This question is frequently posed, with widespread research into the social and economic impact of libraries. Newspapers play an important role in forming public perceptions, but how do newspapers present libraries, their past, present and future? 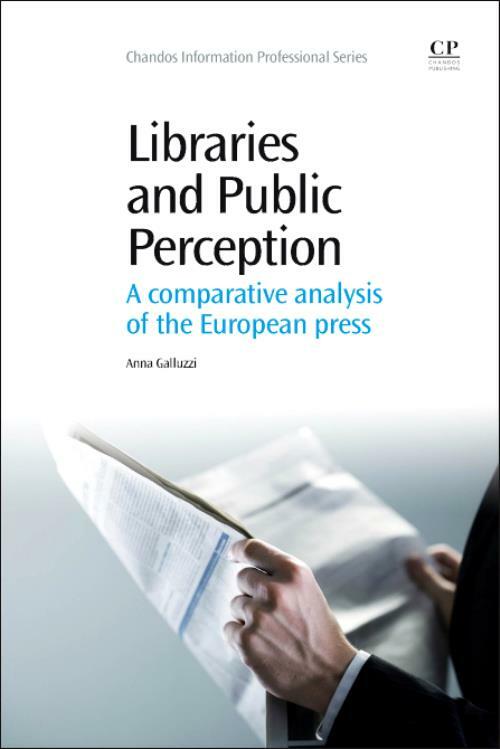 Nobody has yet taken the press to task on the quantity and quality of articles on libraries, however Libraries and Public Perception does just this, through comparative textual analysis of newspapers in Europe. After a comprehensive and useful introductory chapter, the book consists of the following five chapters: Wondering about the future of libraries; Measuring the value of libraries; Libraries in the newspapers; Contemporary challenges and public perception; Which library model from the newspapers: a synthesis. Are libraries a 'hot' topic? Anna Galluzzi graduated from the University of Tuscia in Viterbo in the Conservation of Cultural Heritage, Specialization for Archivists and Librarians, in 1997. She then went on to receive a Degree in Library and Information Science at the University of Rome "La Sapienza, a Master (MSc) in Management of Library and Information Services at the University of Aberystwyth in Wales, and a PhD in Library Science at the University of Udine. Since 2003, she has been working as Parliamentary Administrator and Librarian at the Senate Library in Rome. Prior to that, she was contract professor in Library and Information Science and Library Management at the University of Rome "La Sapienza, as well as teacher in professional classes and speaker at many national and international conferences. In addition to numerous articles and papers, she is the author of the following books: La valutazione delle biblioteche pubbliche. Dati e metodologie delle indagini in Italia. Firenze, Olschki, 1999; Biblioteche e cooperazione. Modelli, strumenti, esperienze in Italia. Milano: Editrice Bibliografica, 2004; Biblioteche per la città. Nuove prospettive di un servizio pubblico. Roma: Carocci, 2009; and Libraries and public perception. A comparative analysis of the European Press. Elsevier, Chandos Publishing, 2014.